Calling all cream lovers out there! Pay attention-there is a new polish brand in town! About nine months ago, I got a tweet asking if I'd review a new brand of polish when it came out. I made sure and asked if it was glitter. I was so happy when he said no glitter this time around! WOOHOO! There are way too many glitter makers out there. I just don't feel there's any imagination to that. You dump some glitter in a bottle and then do different combinations of the same. It's boring to me. But give me a good cream or shimmer and I'm ecstatic. What's the name of the brand you ask? It's Bondi New York. Seriously gorgeous colors and I'm happy to say, a nice formula as well. Let's start with the silly bottle shot ok? This is Contrary Polish Ain't No Sunshine, Bondi Tavern On The, and my beloved Lilacquer Selkie. I started with Sunshine and an accent of Tavern. Tavern is a dark creamy teal and stunning! I thought it'd go well with Sunshine's greyness. Here are the starting shots. Isn't this gorgeous? My one complaint is the cap doesn't come off like a Chanel and it's big and bulky. It makes it difficult when polishing if you have small hands like I do. I have already told the company that they ought to look into this, that I'd bet others would have the same complaint. They promised to look at this for future collections. 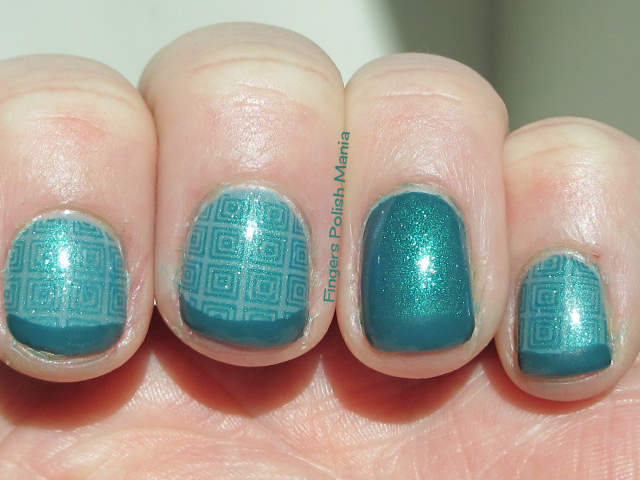 However, this Tavern was almost a one coater and you know how I love to stamp with normal polish right? 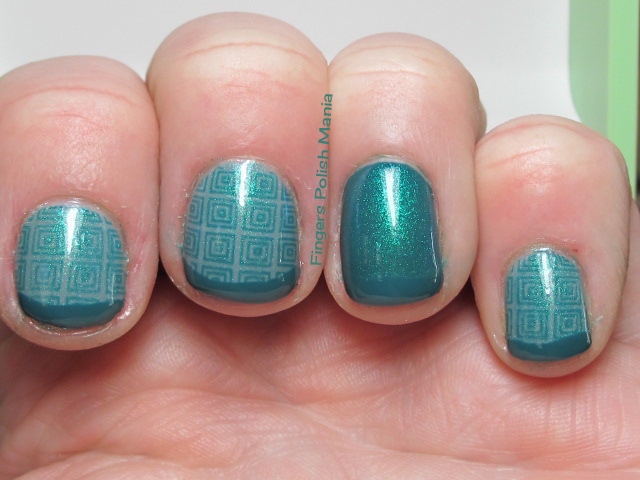 So I tested this brand out and stamped using Gals plate GA19. 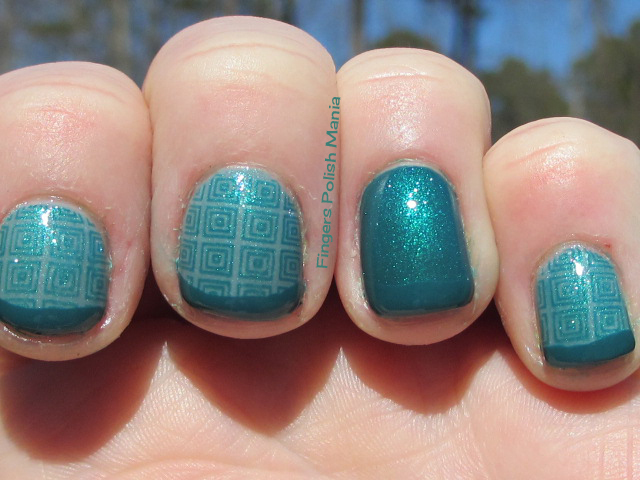 I did not stamp the accent nail one because the teal is too gorgeous and two because Sunshine is way too sheer to stamp with. Here is that step. See how well it stamps? Awesomesauce right there! Next I added a layer of Selkie and my funky using Tavern again. Here are the cool results. I am totally in love with this. It's a teal fest! Oh how I swoon for Selkie! Now this Bondi lasted my normal three days of wear without chipping. So it even lasts like other brands. I am in love with this New Kid on the Block brand. Please go and check out all their gorgeous colors. I have one other to show you on a later post! Thank you to Bondi New York for letting me try out this new brand. I hope I did your polish justice!